Lately I've been tossing around the idea of starting another set collection to go along with my MVP Stanley Cup Edition project. After sorting through some more base cards recently, I've settled on one set in particular. As you can see from the title of the post, I've decided to take a shot at completing the 1996-97 Fleer Metal Universe set. 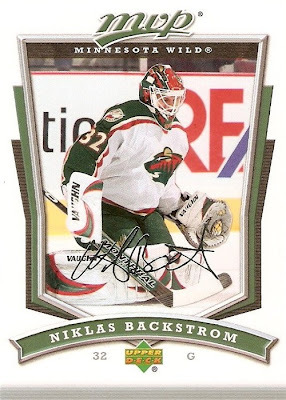 I've kind of hit a standstill with the Stanley Cup Edition set as I have all of the base cards and I'm just working on the hard to find parallels. 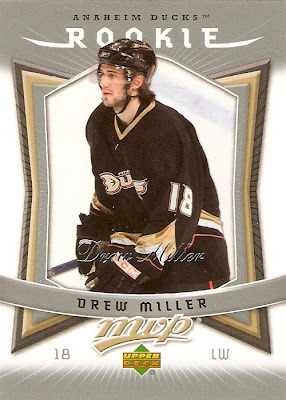 This one gives me the opportunity to chase regular base cards as well as a couple of insert sets. 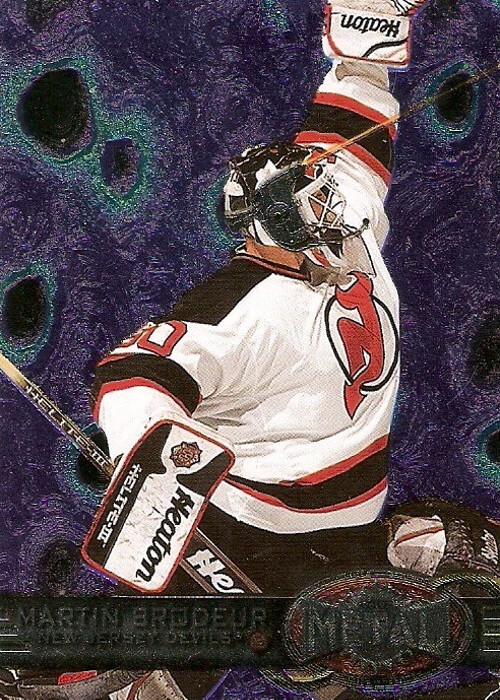 If you haven't been keeping track of My Picks on Card Boarded, I've already shown off three different cards from the set, Bill Ranford, Hnat Domenichelli, and Martin Brodeur, so it fits that I want to complete and share the entire set. 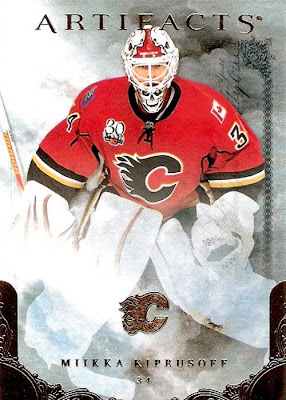 I'm really interested in seeing all the goalie cards from this set as they tend to have some of the cooler looking backgrounds. 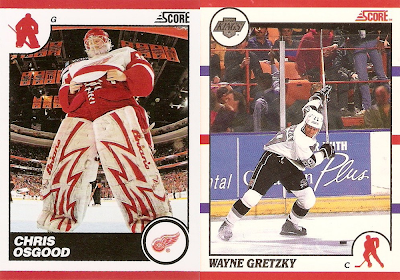 How can you go wrong with the brick wall backgrounds like on the Roy and Fuhr? 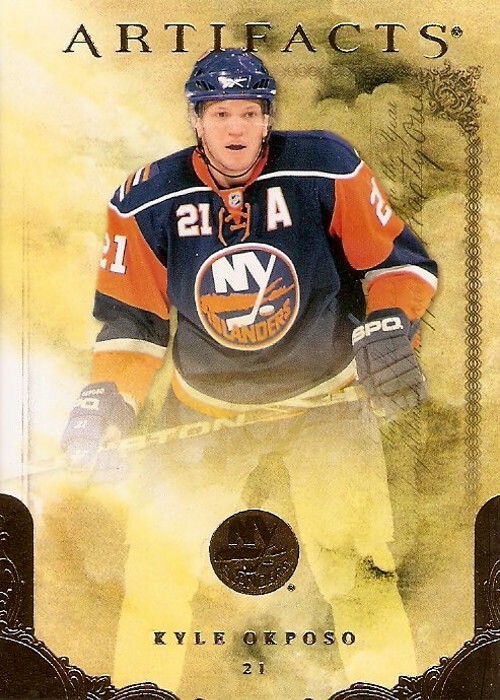 According to Hockey DB, there are 200 cards in the base set including two checklists. Beyond the base set, there are 12 Armor Plate inserts, 12 Cool Steel inserts, 12 Ice Carvings inserts, and 20 Lethal Weapons inserts. That makes for 256 cards altogether, not too bad. Apparently there are also short-printed refractor versions of all the insert sets out there, so that would make for an additional 56 cards, bringing the master set total to 312. As far as parallels, I was searching on ebay and came across some "Precious Metal Gems" parallels in the basketball version of the set from the same year. 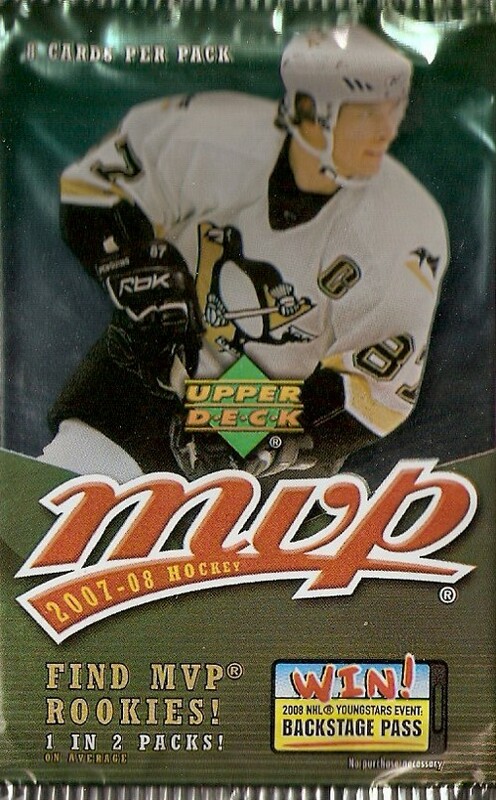 I've never seen any in the hockey set, so if anyone has any information on that I would greatly appreciate it. Well it looks like I'm a little late to the party when it comes to Score (My Hockey Card Obsession, Drop The Gloves!, Puck Junk, Just a Bit Offside, and The Cardboard Review). Regardless, I've been looking forward to busting some packs since the product was announced and I finally got around to buying an 11-pack blaster box for $9.99. I've been watching plenty of Score breaks on the various forums and have been impressed for the most part, especially knowing there's a chance at an autographed card in a $1 pack, that's awesome! Plus there are a few Howard's for me to chase after. I really like the base design for this set. 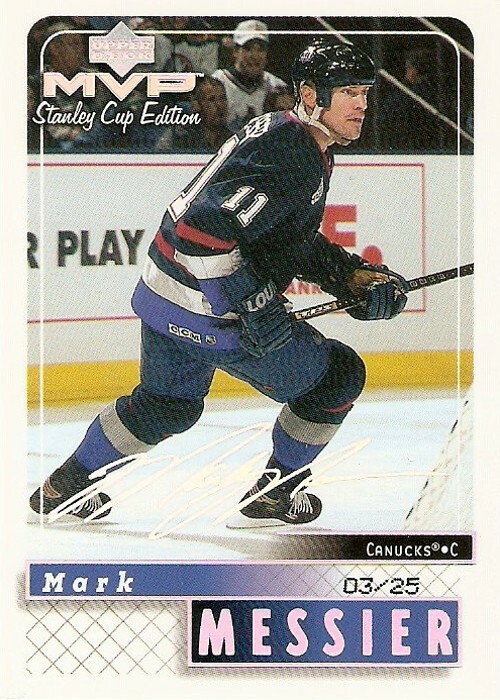 It borrows heavily from the 1990-91 Score design and for good reason as this one marks the 20th anniversary of that set. I love the old school Score logo in the upper right and the position silhouette in the upper left. 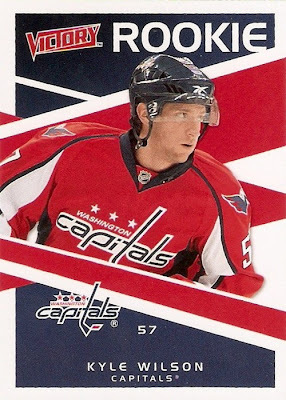 The red borders are identical to the original set, which is a nice touch. I also like the black name bar as the white font really stands out on it. This is definitely an interesting looking design to say the least. 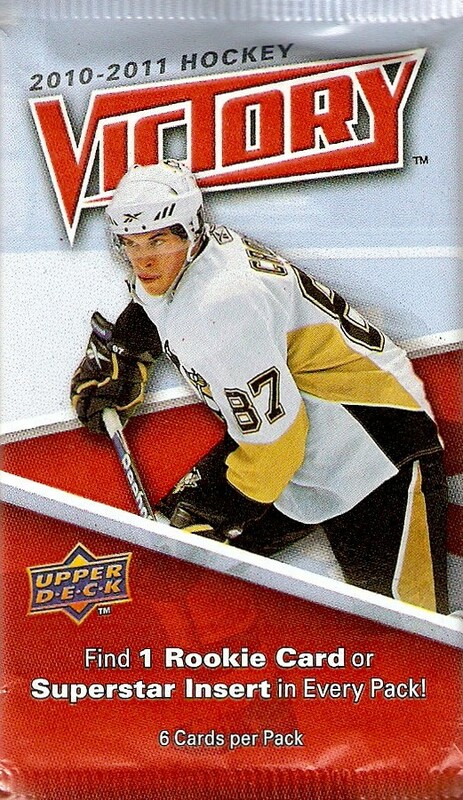 I really like the font on the Hot Rookies text at the top of the card and the background is pretty decent. The bottom of the card is not the best in my opinion. The angles vertical stripes are kind of odd looking and the Score logo in the middle is way to isolated. 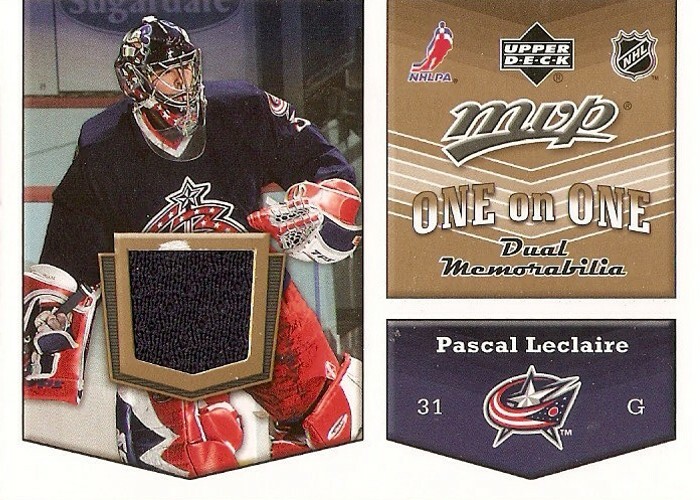 I like the idea for this insert set but the design is a complete fail in my mind. The worst part has to be the vertical font on the team name, it just looks awful. I don't know if it's just this card, but the giant TM in the middle is very distracting. 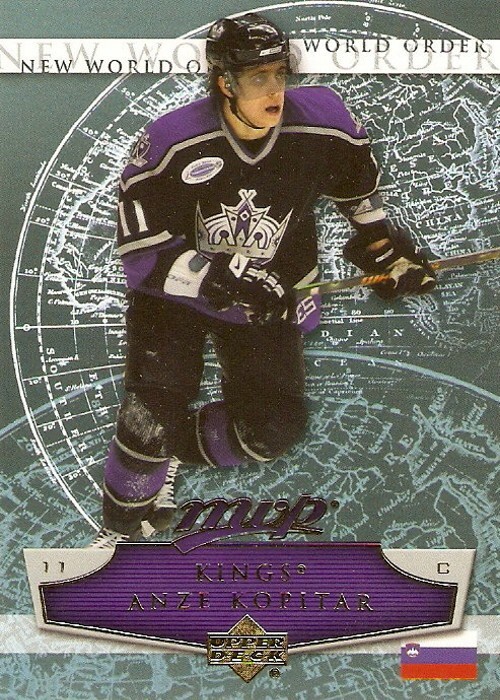 I will say though that I do like the faded look of the team logo in the background, but that's about it with this one. I also like the idea for this set, as well as the look of it. 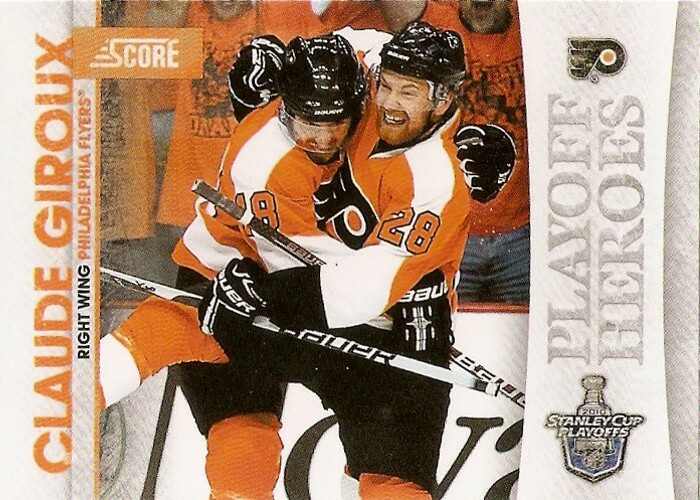 The picture on this card is perfect for the set, as it shows the level of excitement that the playoffs bring. As far as the design, I like how all of the font, aside from the logos, runs vertically. The font on the playoff heroes text is pretty nice too. I love goalie themed sets and this one is no different. I know the idea has been used before but you have to love the goal cam shots when they're used properly. 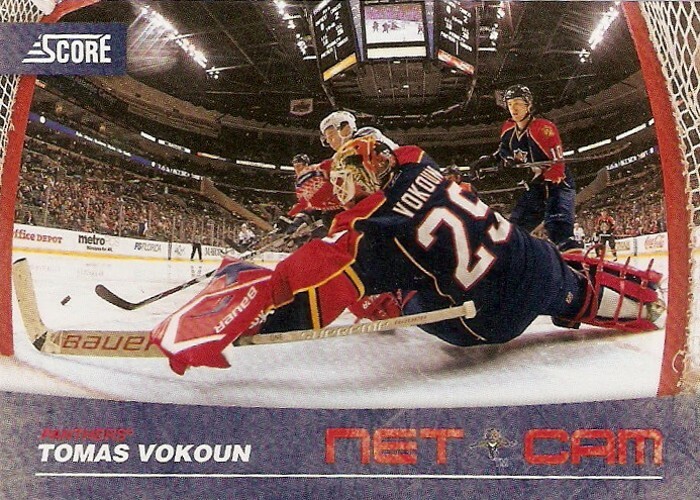 I was hoping for the Howard from the set, but this Vokoun works for me. 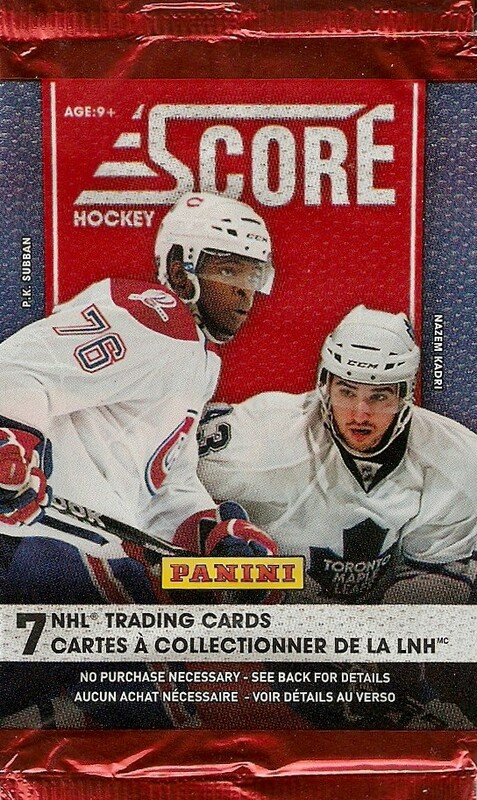 I like how the blue base of the card is curved slightly and how the Score logo comes in from the left side. I also like the font on the net cam text and how the team logo is neatly placed right between the two words. Just for kicks, I wanted to do a quick side-by-side comparison of the two Score sets, 1990-91 and 2010-11. 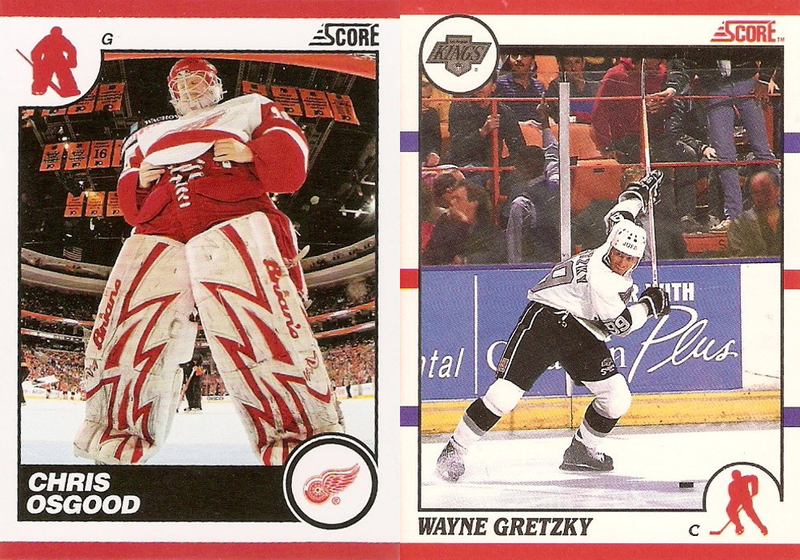 On the left you have Chris Osgood from the new set and on the right you have Wayne Gretzky from the original set. As you can see, they swapped the team logo and position silhouette, which doesn't make much of a difference to me. The most noticeable difference has to be the lack of the blue and red stripes up the sides of the card on the newer set. 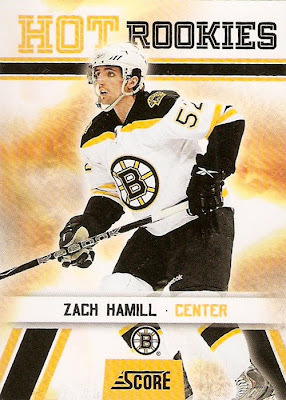 I understand Panini probably did not want to copy the original design exactly so the little changes like the black score logo and revamped name bar are welcome in my mind. Overall, I really enjoyed this break. 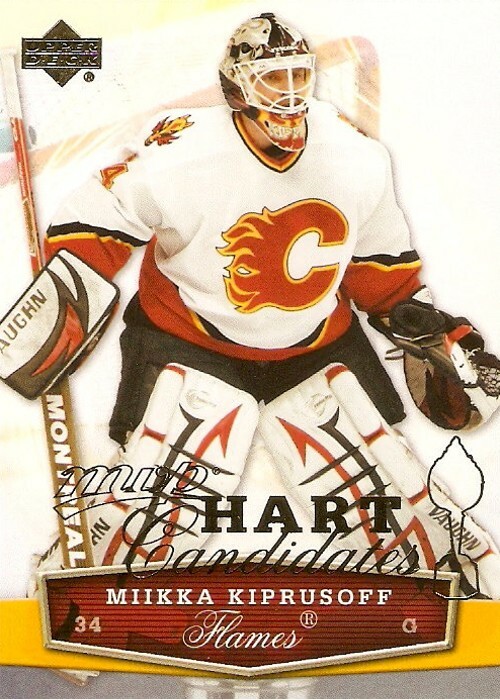 The cards all look pretty nice and there was an excellent player selection. I didn't pull any autos or any of the big rookies, but that's ok as the only cards I'm actively chasing from the set are the Howard base, parallels, and Net Cam cards. This pick is another one that's more about the picture on the card than the card itself. 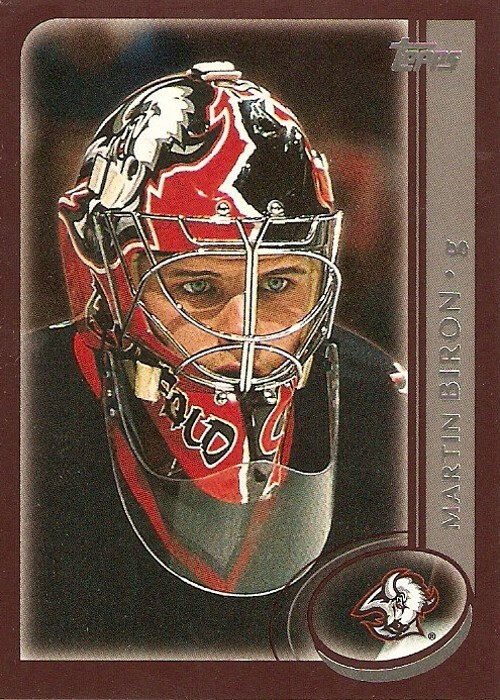 It's just another base card to most people, but not to me as I really like this Martin Biron from 2002-03 Topps. It's got an awesome close-up of his mask. 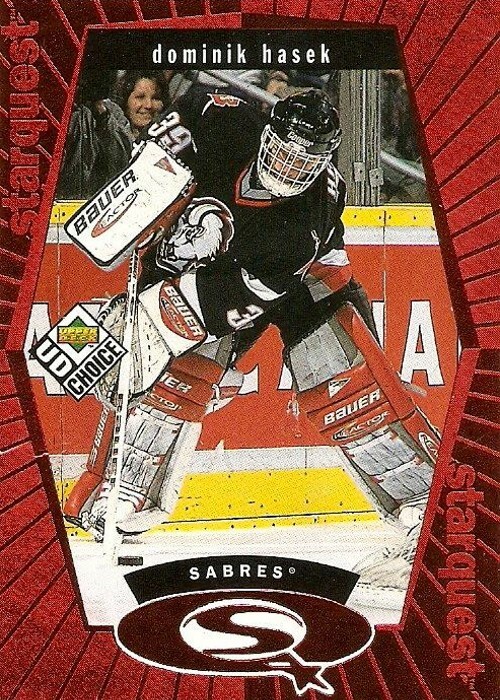 Biron had some nice masks during his time with the Sabres and this has to be one of the best in my opinion. I love how it's split right down the middle with the buffalo on one side and the "B" on the other. The combination of black and red is perfect and I wish the Sabres had stuck with those colors. As far as the set design, this one isn't too bad. The border is a nice neutral kind of maroon color. I like how two of the corners are rounded while the other two are square. 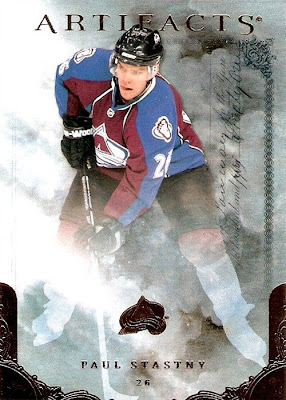 The full color team logo is neatly placed inside the outline of a puck in the lower right corner with the image on the card showing through. The silver foil on the player name is kind of difficult to read on top of the grey, but some of that is just the scanner. It's not too bad when actually holding the card. The only change I would make is moving the Topps logo to the left of the two lines it intersects. I got an itch for breaking a few packs the other day and three packs of 2010-11 Victory hit the spot. I liked the base design from the rack pack I bought earlier and thought a few more base cards in the collection wouldn't hurt, especially for only $1.99 a pack. I ended up with 15 base cards, none which I already had, so that was a good thing. I always worry about getting all kinds of doubles with these kinds of sets. I also got one of each of three possible non-base cards. Here is the rundown. 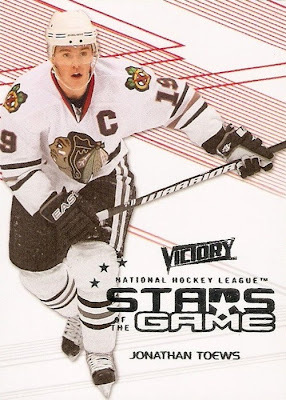 For some reason I like the Stars of the Game set. I think it's the way the image fades to black and white at the bottom. 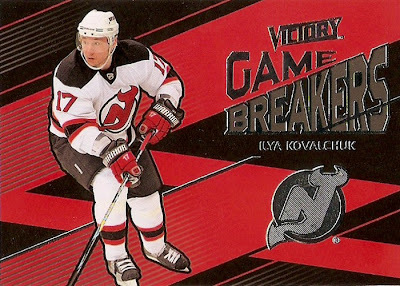 The rookies aren't all that bad and I really like this Kovalchuk Game Breakers. The black and red make for an excellent color scheme. 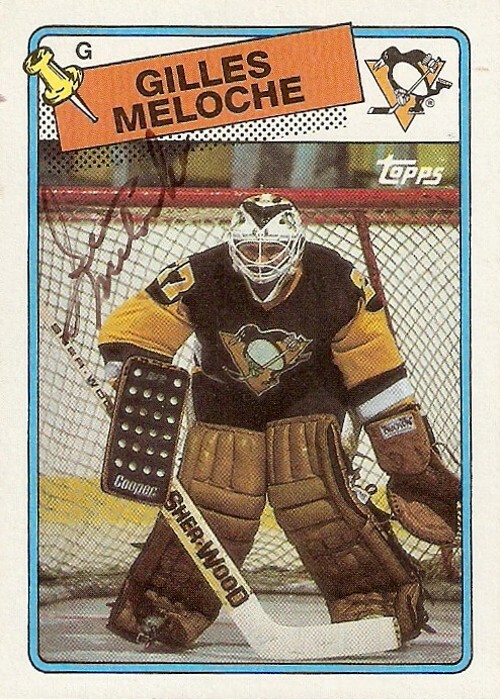 It's been about four months since my last TTM success so these two from former Penguins goaltender Gilles Meloche were a welcome surprise in the mailbox yesterday. Meloche began his NHL career with two games in Chicago before being traded to the California Golden Seals. 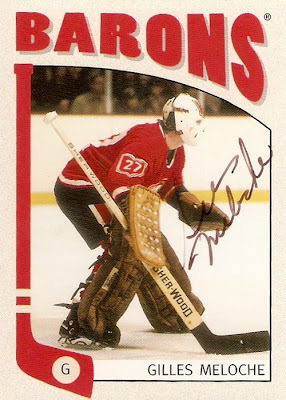 He spent five seasons there before ending up with the Cleveland Barons. He then moved on to Minnesota and finished his career with the Penguins. The first card I sent is from 1988-89 Topps depicting Meloche with the Penguins and the second card is from 2004-05 ITG Franchises depicting him with the Barons. 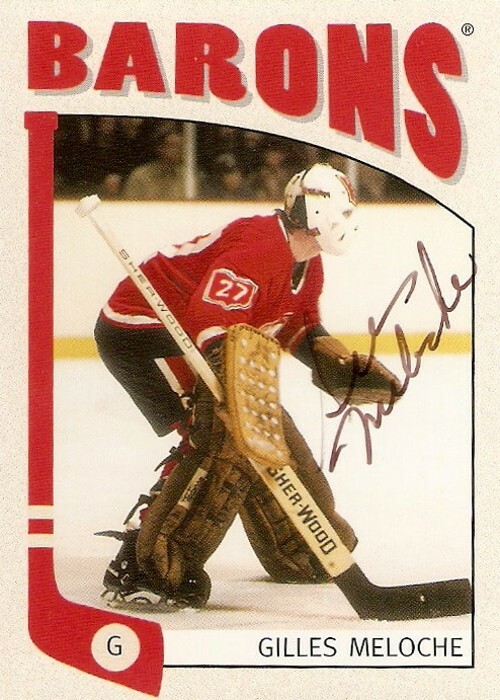 Meloche was nice enough to sign both cards with a fine-tip black marker. It seems like he tried to make sure the signature were as visible as possible, and not right over top the darker portions of the pictures. 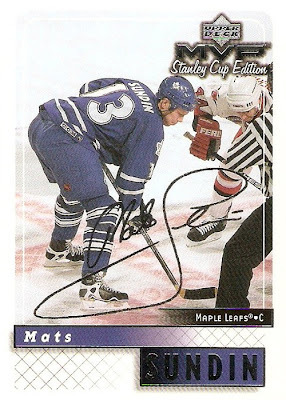 The Topps card is now the oldest in my TTM collection, narrowly beating out my 1990-91 Score Olaf Kolzig. Here's a card that would fall into the oddities category. Nothing too special about this one, just a plain old base card from 1996-97 Upper Deck. What caught my eye though was Trefilov's pad, take a look. See anything a little different on there? 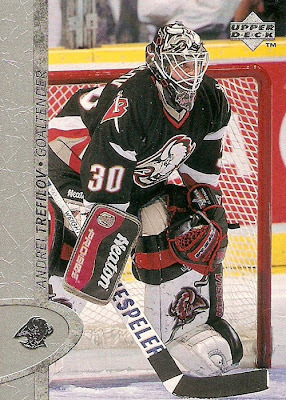 Putting the team logo on a goalie mask is a given, but right on the front of the leg pads? Now that's interesting. In all my years of collecting and watching hockey on TV, I can't say I've ever seen that before. What's even more interesting is the other pad that is barely visible behind the border of the card. It has the same logo as the other pad, but facing the opposite direction. I guess you'd have to do that simply for aesthetics, otherwise it would look kind of weird. As far as the design of the card itself, it's not all that bad. It's simple and leaves plenty of room for the photo. 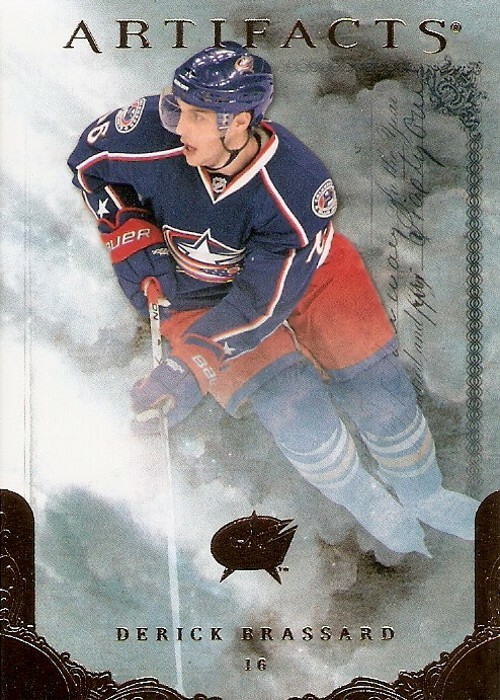 Gotta love sets from the 90's, when base designs actually mattered. What better way is there to start the weekend off than busting some packs? 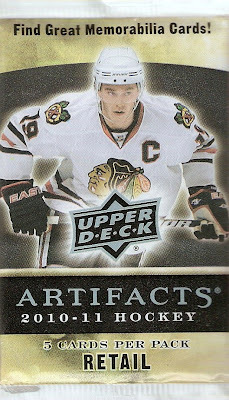 I didn't fell like dropping nearly $10 on packs of Artifacts at the LCS, so a few more retail packs were fine with me. Notice anything funny about these last five cards? If not, take a look back and my last Artifacts pack break and you'll see what I'm talking about. I wonder what the odds of this are. At least they weren't from the same box, that would have just been ridiculous. Of these ones, the Kiprusoff would have to be my favorite just for the simple fact that he is the first goaltender I've pulled from an Artifacts pack this year. Other than that the rest weren't all that bad. Despite the fact that I ended up with and exact duplicate pack as my first break, this set is really starting to grow on me. I'm not one to build many sets, but if I had to choose one this would be up there. In addition to these, I picked up three packs of 10-11 Victory. Stay tuned for those. Here is another card that I chose simply for the photography. 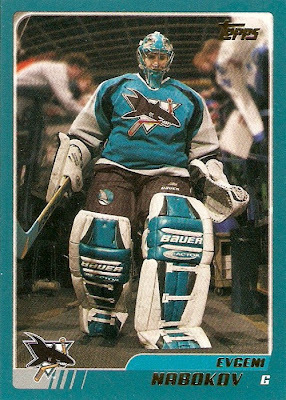 It's a Evgeni Nabokov from the 2003-04 Topps base set. There are plenty of great looking cards like this out there, they're just not ever seen because everyone seems to focus on the "hits" nowadays. I love this photo. It's a real in your face kind of picture and not your usual on ice action shot and it just makes for an awesome card. I really like how they blurred the background so Nabokov stands out even more from everything else. One thing that helps this card, and all sharks cards for that matter from this set, is the border color. It's nearly the same as their team color and it helps bring the entire card together, unlike some of the other color combinations in this set. Other than the photography, this set design is pretty solid. 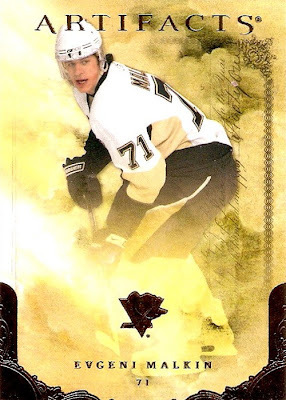 I like the gold foil used for the Topps logo and the player name. I also like how the team logo is fairly small and neatly placed in the bottom left corner, leaving the picture pretty much unobstructed. So far, November has been a great month for the Super Script collection as this is the second to arrive in five days. At that pace, I should end up with six by the end of the month. Oh how I wish that could be true, these things are not exactly easy to come by. 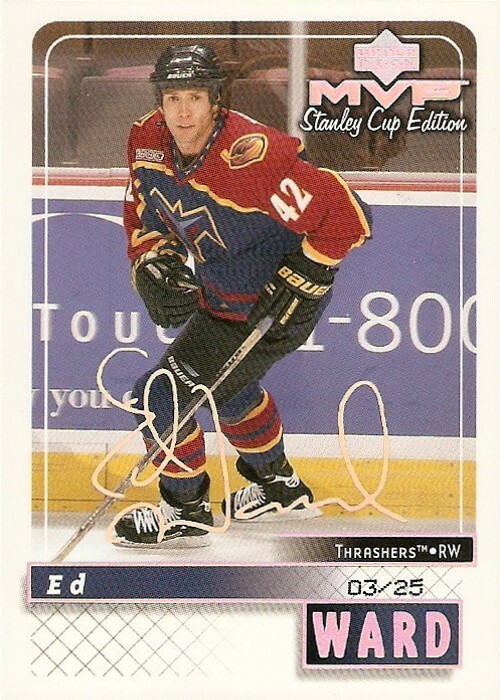 Anyway, this Ed Ward numbered 03/25, just like the Messier, is yet another pickup from the wonderful world of ebay. Got it for just under $10 delivered from Quebec and it brings the Super Script total to 14. The Thrashers become the third team with two representatives in the Super Script collection, the other two are San Jose and Pittsburgh. I think it would be pretty cool to come up with a team set of these. After going to store after store looking for 10-11 Artifacts retail, I finally found a fresh box of packs at my local Target store. I was just looking for one pack and at $2.99 each I didn't want many more than that anyway, just interested in checking out the base designs. 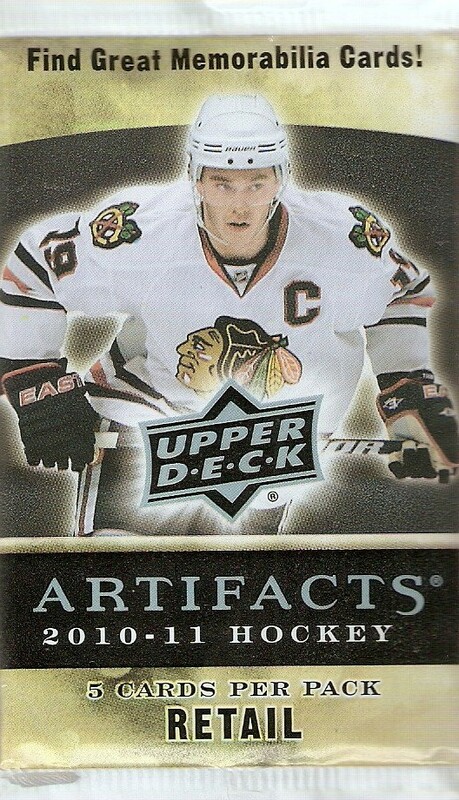 I have to say I really like this version of Artifacts for some reason. The cloud-like background is pretty nice and I like the foil used on the bottom corners, logo and text. I could maybe do without the fading of the player image at the bottom, but that's it. I ended up with two blue-tinted and three yellow-tinted cards, anyone know if there is supposed to be a difference, or is the base set just a mish-mash of the two? 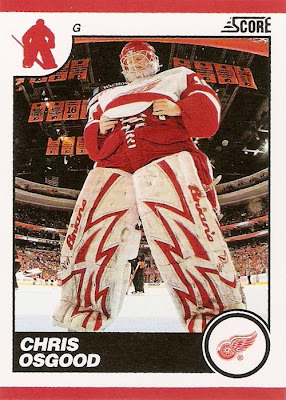 Not sure if I want to build the set, but I do know I need to get going on all of the Jimmy Howard's from this set. Some of the more difficult parallels should be fun to track down. 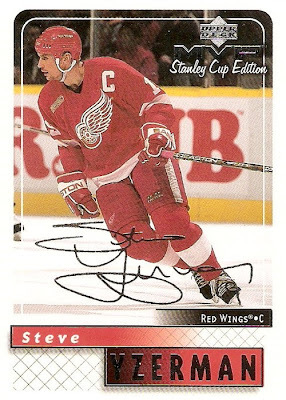 The Yzerman has to be the best I've added to the Silvers yet, even if it's facsimile on this card, Stevie Y has an amazing signature. I can only hope to get the Gold and Super Scripts for guys like him, but hey you never know, I never thought I would get with the Messier. The rest of the 13 included: Morrow, McCauley, Sellars, Amonte, Primeau, Sivek, Tuomainen, Hrkac, and Brown. For scans of those and the rest of the Silvers, check out my Card Boarded Picasa page. Finally, I was able to track down another Super Script after a bit of a drought lately. This Mark Messier is one of the bigger names in the set and I'm glad to be able to cross him off the list at this point. This one is only the second Super Script I've acquired from somewhere other than ebay or a pack, the other being the Martin Sonnenberg from SportsBuy. 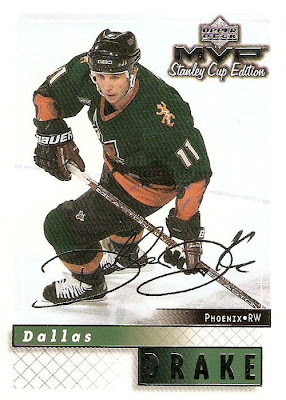 I actually got a great deal on this one from fellow blogger Brett over at My Hockey Card Obsession. It's the 13th Super Script in the collection, which puts me at 6% of the set. That may not seem like a lot, but it far exceeds where I thought I could get in the time since I started this collection. Along with this Super Script, I also added 13 Silver Scripts to that collection. I'm saving those for another post though. 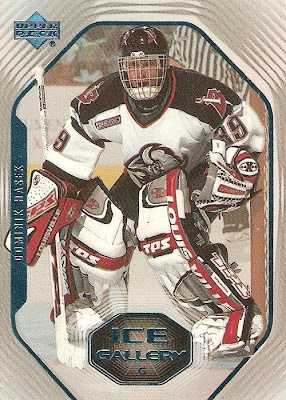 Now that I've decided to continue going after Hasek cards, I thought I would share some favorites from the cards I have so far. Nothing spectacular here, just a few that stand out. 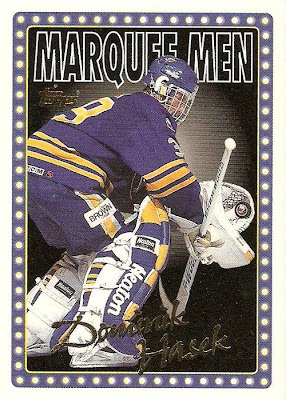 This one from '95 Fleer is not the most spectacular card in the world, but there is just something about it that stands out to me. 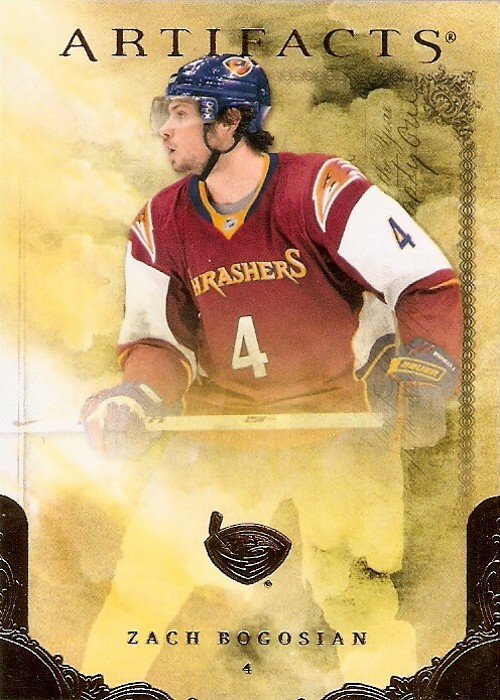 For starters, I always like cards showing Dom in blue and gold. Other than that, I find it interesting that they put his information (i.e. birth date, height, and weight) right on the front. Yet another with Dom in the blue and gold. This one is a Marquee Men from 1995-96 Topps. I've always like this set for some reason, I think it must be something with the border. Now I just need to find the power booster version of this one. This one is a bit newer and features the revamped black and red jerseys, which I happen to really like. This one is from 1998-98 UD Choice and it's a red version of the Starquest insert. Apparently there were three versions including red and blue. I just like this one the most because the red fits perfectly with the revamped jerseys. 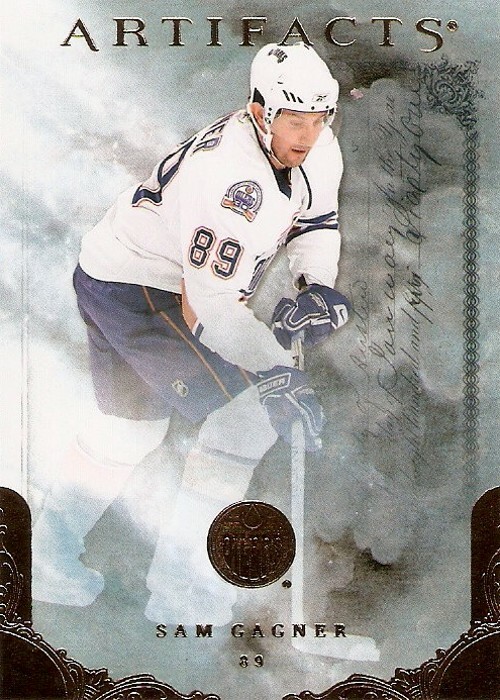 This one comes from 1999-00 Upper Deck and the Ice Gallery insert set. There is just something about this set that I really like. The blue foil is a nice touch and the shape of the photo window is kind of unique with the border surrounding it. This is the standard version of the card, as there is a Quantum Silver version numbered to 100. 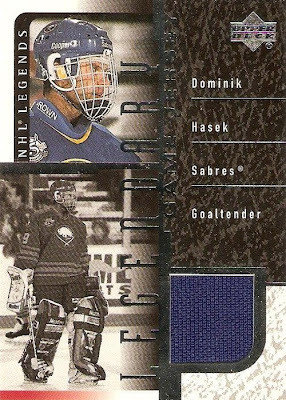 This Legendary Game Jersey insert from 2000-01 UD Legends and is the only Hasek memorabilia I have in the collection at this point. 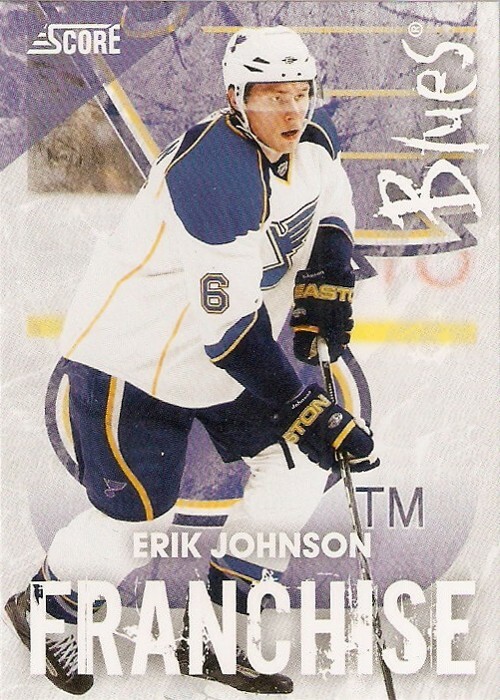 I like that they actually have the same color jersey swatch as the jersey shown on the card. The only thing I don't like is the repeated image, at least one is color and one black and white though. 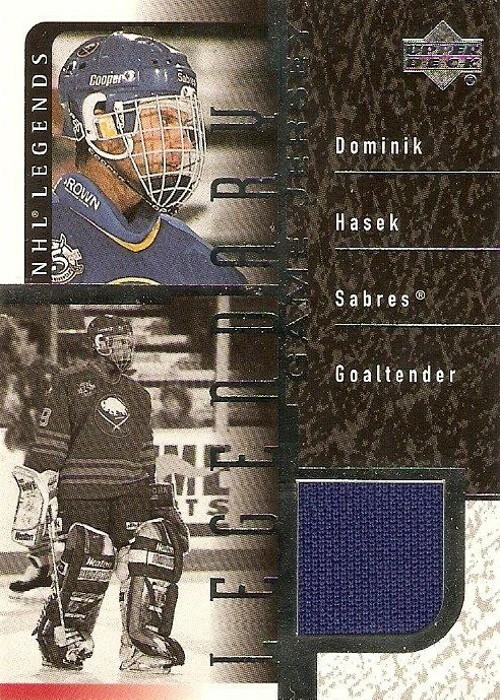 So that was just a sampling of the cards I currently have in my Dominik Hasek collection. I plan on sharing some more of what I already have and any new additions to the collection. 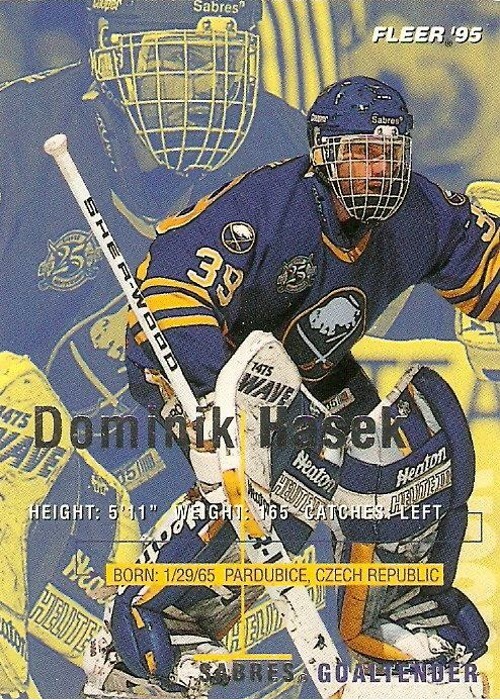 I've got less than 100 different Hasek cards, which isn't exactly impressive, but a decent start I think. According to a few resources, there are well over 1000 Hasek cards out there so I definitely have a ways to go for my collection to be of any significance. This pick comes from one of the more unique sets from the late 90's, and that set would be 1996-97 Metal Universe. This Marty Brodeur has to be one of the best, it's right up there with this Bill Ranford. 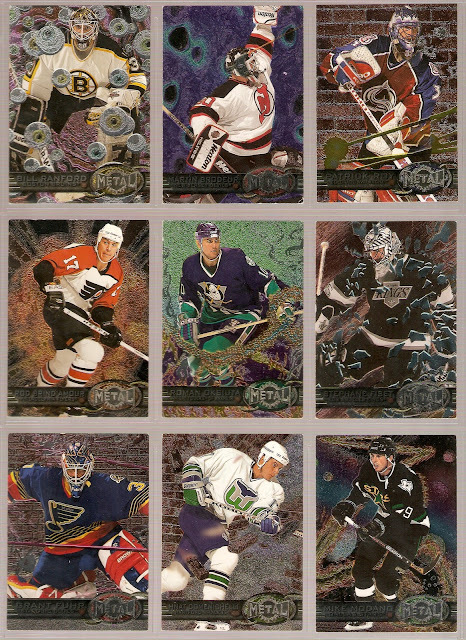 These cards look so much better in person, especially with some of the backgrounds and intricate designs like this one. I guess some cards are just not meant to scan well. One thing I do like about the set is that every background design is different, that's something you don't see much of. I also like the fact that all of the text is at the bottom of the card leaving the rest of the top portion unobstructed. Someday I would love to collect the entire Metal Universe base set, just to see all of the different backgrounds and any other oddities they came up with, like the laser beam head set on Brodeur's mask. I was at Target deciding how to use my share of a $25 gift card and as usual I wandered down the card aisle and saw some 2007-08 Upper Deck MVP blaster boxes marked down to $7.99, so I grabbed one. I haven't busted much of this product in the past, so I didn't really know what to expect from 12 packs, which at the $7.99 sticker price worked out to only $0.67 a pack, can't beat that. I'm not a huge fan of the base design for this set, but it could have been a lot worse. I like the shape of the borders around the image and the arched name bar on the bottom. The worst part about them has to be that awful MVP logo. I wish they would have never changed it from the original design from 99-03. As with other MVP releases, the rookie cards are similar to the base design. In this case, the name bar is slightly different, the MVP logo is now on the bottom, the word "rookie" is added to the top, and the facsimile signature is a simple script font. We begin the inserts with this Peter Forsberg from the Game Faces set. The idea for this set was good, but the end result, not so much. 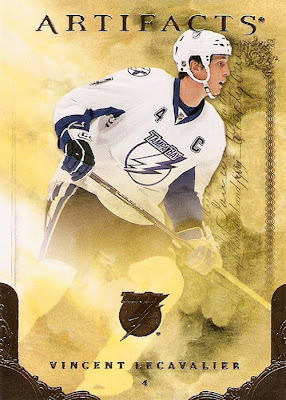 It just looks way too much like the base design, other than the gold foil and the extra lines around the borders. This has to be one of the coolest inserts sets I've ever seen from an MVP release. I really like the background color and the old fashioned map design. I also like the name box on the bottom and the use of the gold foil. The country flag on the bottom right also adds a nice touch. The other of these was Zach Parise of the Devils. This set is pretty self explanatory. It's not the best looking insert set in the world, but there are a few things I like about it. One would be the name box at the bottom and another would be the outline of the trophy in gold foil. 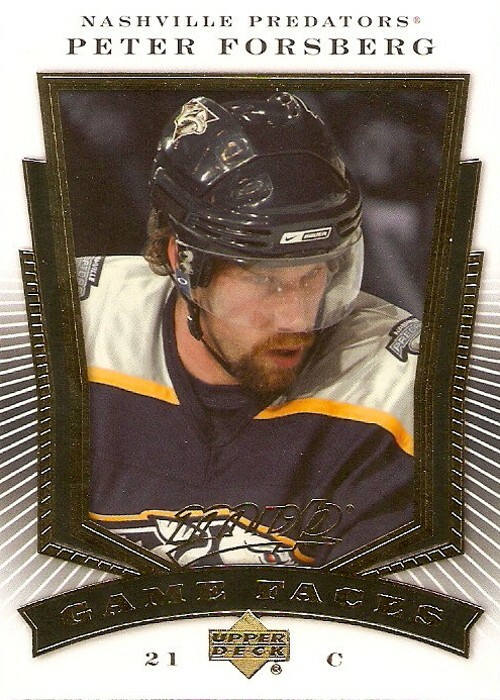 This insert set also borrows heavily from the base design, in terms of the border around the player image. They're actually not that bad overall. 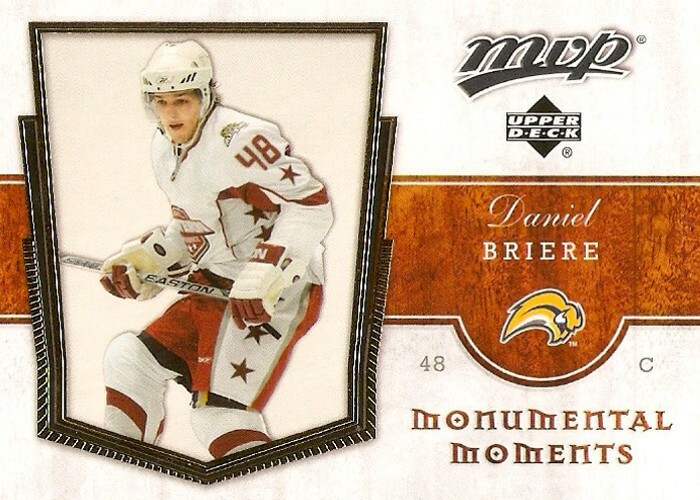 I really like the kind of wood grain texture and the font used on the monumental moments text is just amazing. These were one of the bigger hits possible and I'm actually surprised I got one. I knew I had one when I felt the pack it came in. These things are massive, like around the thickness of five base cards. I like the concept, but the design is pretty lame if you ask me. 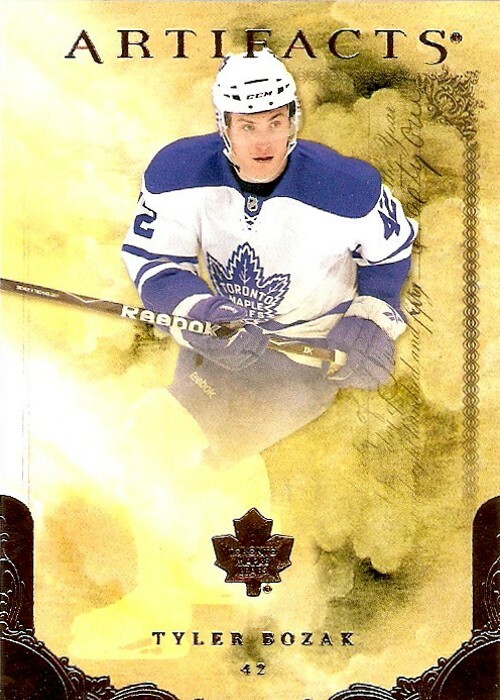 Again, like some of the other inserts, it borrows from the base design. In case anyone was wondering, Manny Legace is on the reverse side. 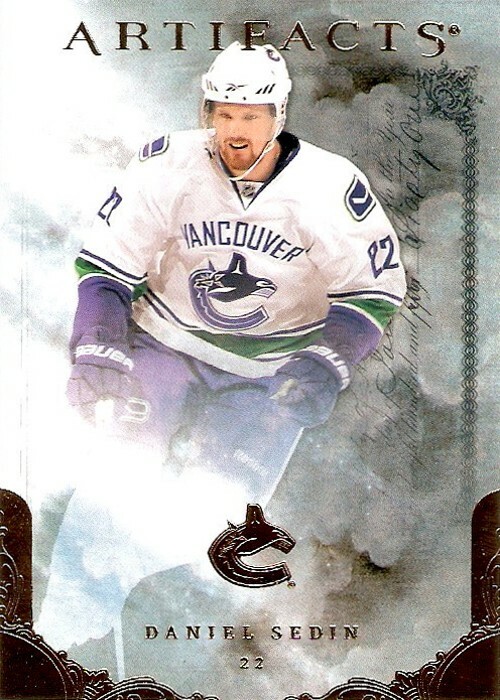 Also, if you haven't already looked closely at the scan of this one, the card is pretty damaged. In hopes of maybe getting this card replaced, I got on the Upper Deck website and found the contact information for customer service and explained the damage in a quick email. Here is the reply I got. Now what? I've got a mangled piece of cardboard. Should I try asking them for a replacement anyway? Or should I just let it go? After all, I did only pay $8 for the entire blaster box, and its three years old.